Manufacturing as an industry is a vast world of pricing variables and product options that is prone to error in the CPQ process. Configuring a quote is a time-consuming process that takes the consideration of countless factors, add-ons, and restrictions in order to preserve your profit margin. And having your sales team manually compile prices allows for human error in calculation and unapproved upselling in order to land a deal. There are just too many components in your operations to leave anything up to chance when it comes to your quoting practices. Implementing a QTC solution is the best way to ensure accurate quoting and pricing, build forecasts and analysis for future business, and increase the overall agility of your sales cycles. Is your manufacturing business still using manual CPQ practices? Let’s take a closer look at the benefits of adopting a CPQ software solution for your manufacturing business. When you put the highly flexible price configuration environment of manufacturing into human hands, there are bound to be errors. These errors can range from bad manual quotes, discounting and pricing errors, failure to follow informal approval processes, duplicate or bad data entry, and manual billing and invoicing. This means a lot of time and money falling through the cracks. But the adoption of a CPQ solution can automate all of these fluctuating and time-consuming tasks, freeing up your reps to focus on the part of the business that makes money—selling. Additionally, a CPQ solution is able to interpret all of this data for you and present it in user-friendly, integrated dashboards and reports for analysis. You can reduce quoting and approval times down from weeks to hours, positioning your business to scale, pivot, and grow. The visibility into the global quoting and discounting practices across all of your reps can help you eliminate leakage and achieve a higher percentage of your total addressable market. Due to increasing fierce global competition, profit margins continue to be squeezed for manufacturers—both small and large. Complex products and configurations require heavy collaboration with business and engineering experts and are often highly customizable. Now more than ever, technology solutions are needed to help companies grow and scale their business so they can compete on the worldwide stage. 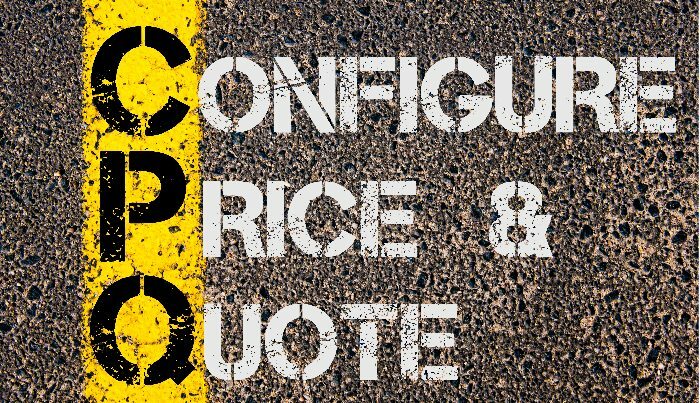 Without CPQ software, you are more than likely going to receive hundreds or thousands of different configurations of pricing and quoting. Once you implement CPQ, you are able to eliminate the chance of non-standardized quotes, discounting, and rebates, and instead are able to promote smart upselling from your sales reps. In addition, you can visualize the channel partners who are producing the best margin for your business in real time. You can also monitor historical trends in profitable quotes across reps, segments, geography, or even channel partners. CPQ can help you know in advance what discount you gave to a reseller or dealer and which partners are generating the best margins. Anecdotal stories usually contradict the true reality of who your best customers really are. When sales reps aren’t using a formalized quoting process, you are missing out on critical customer-specific data and, as an effect, you might lose sight of who your customers are over time. By not having a centralized selling process, you are missing opportunities to connect with your customers and build on your customer experience. Efforts to reach out via email and offline conversations tend to be lost by field reps, especially when added to a communication late in the process. The centralized process of selling found in CPQ software ensures that you keep record of all interactions, providing insightful metrics, enhanced processes, reduced overhead, and better overall visibility into your channel. Furthermore, indirect selling can make your business susceptible to competing against itself. This can be something as simple as getting a quote from two different reps to more complex scenarios like bidding on RFPs with multiple partners. Without CPQ to share data across the organization, this will have a major impact on your margin and will also inflate your forecasting. Manufacturers often have a long line of reps, distributors, dealers, and retailers they have to get through before the product even reaches the customer. A CPQ solution gives you an opportunity to connect the dots down the pipeline of resellers and gain deeper insight into your full customer base. Whenever you buy a product, you may notice a message on the side that reads “do not return to store” or something similar. That’s because the manufacturer doesn’t really know who the end customer is most of the time, but QTC software is slowly changing the way manufacturers think about their customer relations. Have you ever made the goal of becoming “easy to buy from”? If so, you might have found that getting an accurate quote out to a partner or customer is one of the most difficult processes to achieve that goal. To be easy to buy from, it is recommended that you evaluate yourself against a general rule of standardized quoting. If the proper pricing rules and discount approvals are in place, 80% of quotes should be able to be auto-approved and sent immediately. In turn, the other 20% of non-standard quotes will also be quicker by filtering out standard versus non-standard quotes. ASC 606 is still a new term for many executives outside of finance and legal departments, but it should not be. While most back office executives have been planning and prepping for the new compliance regulations, it has not hit the front office yet. It should be known: ASC 606 can have a major impact on sales and marketing efforts, affecting pricing, discounting, product bundling, services, and how you go to market. Major changes are on the way, and CPQ can provide the tools you need to track and report on revenue recognition. Is your manufacturing business still using manual CPQ practices? Is it possible that these antiquated processes could be costing you time and money? Perhaps it’s time that you consider implementing a CPQ solution in order to improve your customer experience, streamline processes, reduce margin pressure, minimize lost revenue, and create more valuable insights for your business.